I had been waiting for 5 weeks and finally the Thai class took place :)! The curries, soup, noodles and salad - all the dishes were amazingly tasty! 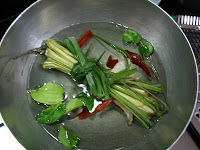 I had to make some dishes on Saturday itself at home so I took lemon leaves and lemon grass from Rajul. I made green curry, pad thai noodles, tom yum soup and side of brown rice for the family. All the dishes became such a hit! This class is just superb. All the family members are so happy and thankful that I have found these classes :).